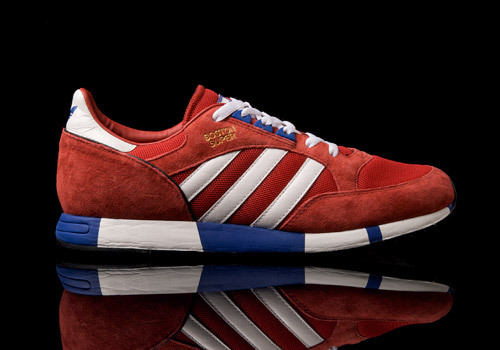 The adidas Boston Super is a lesser known silhouette from the infamous three stripes, originally released in 1984 as a running shoe. 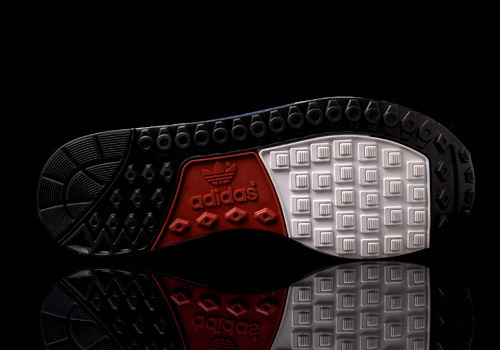 Since then many new colorways have been produced and even some design collaborations have been formed to bring consumers special releases. 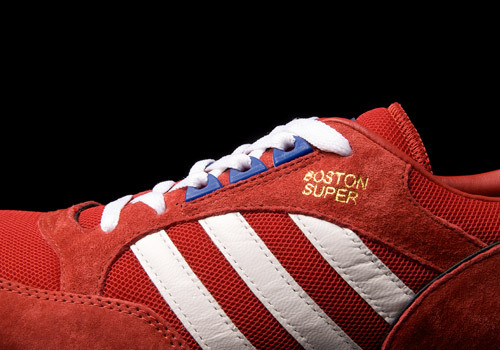 Pictured here is the adidas Boston Super “Red Suede” from 2005. 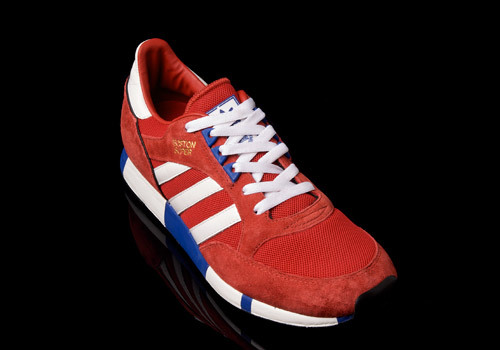 The soft red suede upper is broken by well padded, breathable, red mesh, and accented by white leather side stripes and heel patch. Navy blue ghillies, heel patch trefoil, and sections of the midsole tie the colorway together. Bits of black can be found curving up the toe box from the outsole, along the inner edge of the eyeslet areas, and on the trim above the suede heel. 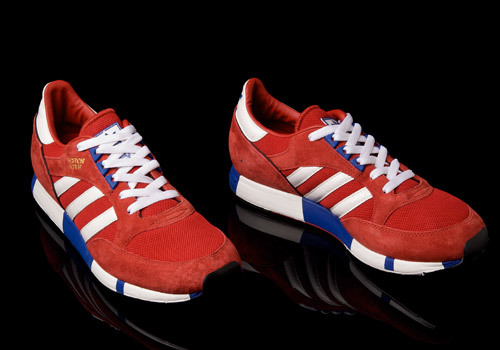 Packaged in an adidas Originals royal blue box, the shoes are completed with a rubbery white and blue logo patch sewn into the red mesh tongue and topped with clean white laces. 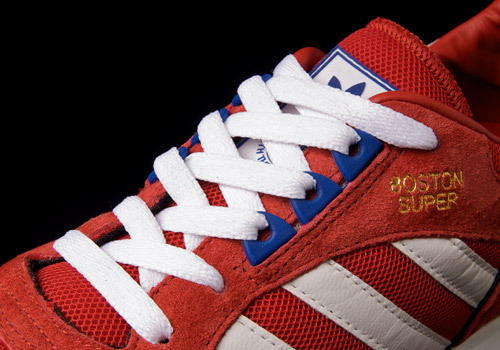 Boston Super is clearly written in gold lettering on the outer wall, above the third side stripe and below the final eyestay. 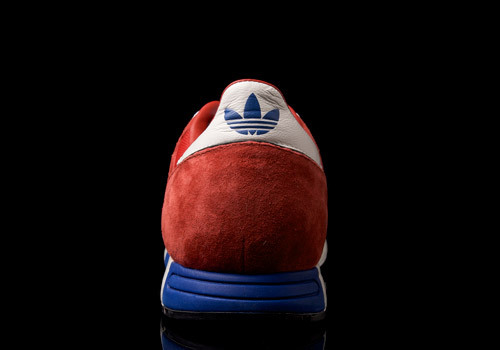 As a running shoe the adidas Boston Super gives the wearer great comfort mostly due to the well padded insole and flexible mesh that makes up half of the upper. The whole foot feels very well supported, with great traction along the bottom, and the curved outsole gives the wearer a sure step when lifting their heel off the ground. 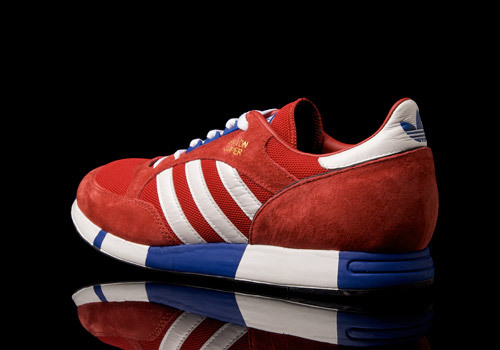 I have the Consortium Bodega pair – blue and grey – a handsome shoe!